Brett Jenks (right), Rare President and CEO, speaks on the October 2018 “Our Ocean, Our Legacy” Marine Protected Areas Plenary Session, along with John Kerry, former U.S. Secretary of State, and others. Fish Forever has seen a year of pivotal moments for small-scale scale fisheries around the world. Indonesia’s historic designation of the Dampier Strait as the largest network of TURF reserves in the world. The closing of the world’s first impact investment fund for coastal fisheries (The Meloy Fund). New mayoral alliances in the Philippines and Honduras committed to championing community-based fisheries management. A Center for Behavior & the Environment that harnesses the power of behavior change to help fishers adopt more responsible behaviors. And, just recently, an announcement at Our Ocean by Bloomberg Philanthropies committing $86 million to expand its Vibrant Oceans Initiative to ten countries and working with Rare to prioritize the coastal fishing sector in a selected few. Many of this year’s moments have demonstrated, more than ever before, greater awareness and recognition of the importance of coastal fisheries and effective fisheries policy and management—for food, for jobs, for meeting multiple UN SDG targets, for contributing to national economies, for ensuring a healthier ocean, and for developing secure, climate-resilient communities. Together, these moments create important momentum for the sector. At COFI33, there was significant attention on implementing the Voluntary Guidelines for Securing Sustainable Small-Scale Fisheries (SSFGs), with more side event proposals about the SSFGs submitted than any other topic. The 3rd World Small-Scale Fisheries Congress revealed a growing network of researchers, governments, foundations, fishers, and NGOs committed to building capacity in this sector and elevating the socio-economic contribution they make to communities and countries. At the second Tri Hita Karana Forum for Sustainable Development, focused on Blended Finance, Rare presented coastal fisheries as an investable proposition; and shortly after that (at Our Ocean), reinforced the need for countries to prioritize SSF reform to facilitate sustainably financing the sector. Not only is Rare encouraged and inspired by such momentum, but believes that with continued commitment and financing, the momentum will transition into a transformational change for small-scale fisheries—in which governments prioritize SSF in their development plans; the private sector invests in SSF management; communities manage their resources; and overall, sustainability becomes the new norm in coastal fisheries. Welcome to Rare! 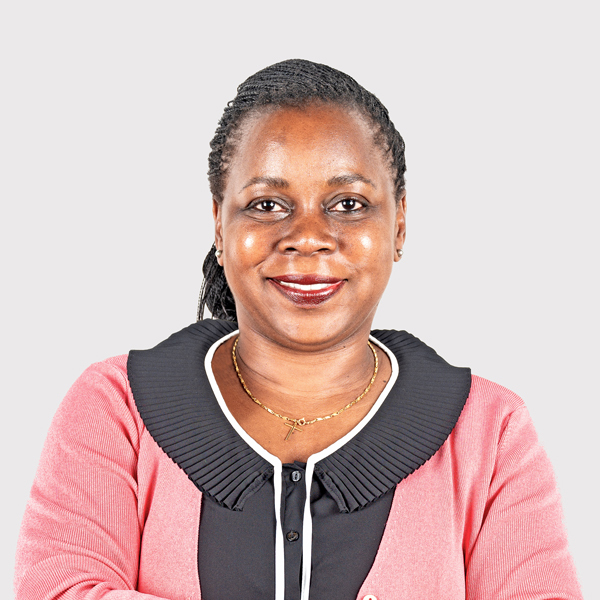 As a former Advisor to the Mozambican Minister of the Sea, Inland Waters and Fisheries and Head of the Ministry of Fisheries’ Department of International Cooperation, what brings you to Rare? Thank you. I left the public sector and joined Rare because I was interested in being part of an organization introducing innovative solutions and behavioral insights to help the government overcome critical issues with small-scale fisheries management. I wanted to contribute to my country in a new and inspiring way. How would you describe Fish Forever Mozambique in five words or less? Building trust–with communities and government–and working together to address the challenge of changing behaviors. Is that five? Trust, Communities, Government, and Behavior Change. How can Rare best support the government to prioritize Mozambique’s small-scale fisheries? With a coastline extending almost 3,000 kilometers, we need to work together—Rare to facilitate knowledge transfer on community-based management for small-scale fisheries, the government to review the fisheries legislation, and together to ensure that concepts like managed access and co-management are embedded into relevant policies, so that we have the legal platform to work and scale. What do you think is the greatest opportunity for collaboration? After three years of Rare’s establishment in Mozambique, the government is on board with the Fish Forever approach and we are strengthening our relationship to capitalize on the abundant opportunities for collaboration: continue ongoing discussions about scaling the electronic fisher registration to the national level, to bring artisanal fisheries into the formal economy and support sustainable small-scale fisheries; scale Fish Forever’s approach to the district/provincial level and prepare fisheries co-management plans; and co-organize and connect campaign launches with moments of pride for the fishers, such as the World Fisheries Day celebration on November 21. Tell me about this new maritime fisheries regulation, which will soon be officially approved. What is it and why does it matter? In simple terms, the maritime fisheries regulation has been under revision for the last two to three years. The final document incorporates community-based management approaches to fisheries, framing provisions for formal designation of community-managed areas with dedicated plans and giving fishers vastly more power to manage their coastal resources and be involved in the fisheries decision-making process. These provisions are important for Rare’s work in Mozambique. That sounds like encouraging progress! What’s next? In the next couple of years, we will focus on setting up well-defined and legalized managed access areas, co-drafting local management plans, exploring how to build secure livelihoods for fishers, enhancing community engagement, and supporting the government to establish and apply a sound co-management model across the whole country. While there is much work ahead, I believe that we can create a model for other countries on the continent to follow. 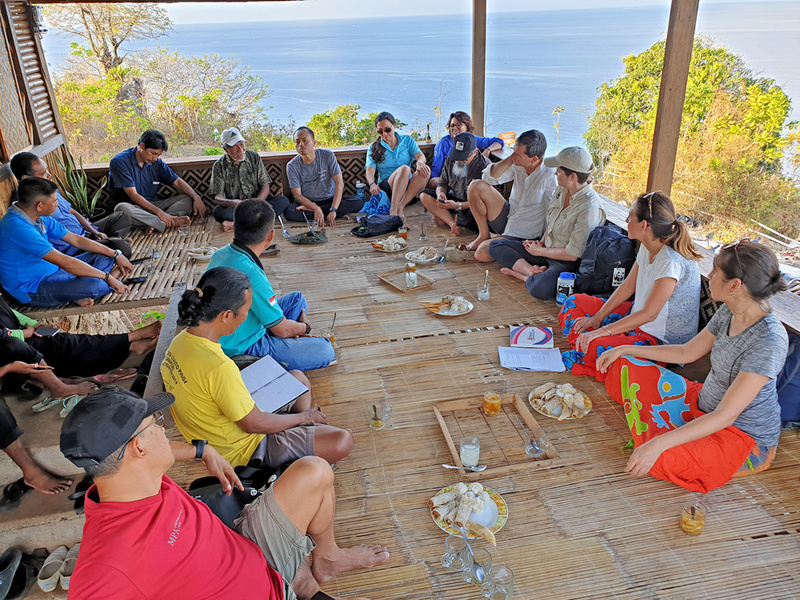 Dialogue among community association “Cahaya Trans”, BAPPENAS, Rare, and the Provincial Marine and Fisheries Agency during BAPPENAS’s field visit to Fish Forever field site in Bunaken National Park in Indonesia’s North Sulawesi Province. As part of an increasingly close collaboration with BAPPENAS—Indonesia’s National Development Planning Ministry—Rare in Indonesia recently partnered with the Ministry to facilitate a targeted focus group discussion on integrating coastal fisheries development into the draft national mid-term development plan, 2020-2024. Opening remarks by Dr. Sri Yanti JS, BAPPENAS’s Director of Marine and Fisheries Affairs, stressed the importance of incorporating the small-scale fishing sector into the successive development plan, while inputs from participants—including officials from the Ministry of Marine Affairs and Fisheries and provincial government alongside fishers, a fishers’ association, fish buyers, NGOs, and a donor—emphasized the many opportunities to prioritize and quantify the sector as a core strategy of Indonesia’s “green development.” The challenges and solutions solicited will become part of the background study prepared for the final plan. Meanwhile, Rare is also collaborating with BAPPENAS to achieve SDG-14. Rare is part of the Centre of Excellence for the SDG-14 (housed within the Bogor Agricultural University’s Faculty of Fisheries and Marine Sciences), working with the Indonesia SDG National Secretariat (housed within BAPPENAS) to solicit inputs for developing indicators, creating a national roadmap, reporting against SDG-14, and contributing ever-important field-based examples at major international forums—such as Our Ocean, the UN Ocean (SDG-14) Conference, and COFI 33—and in important reports (e.g., the 2017 Indonesia Voluntary National Review of SDG 6, 7, 11, 12, 15, and 17 delivered during UN ECOSOC’s High Level Political Forum in 2018). 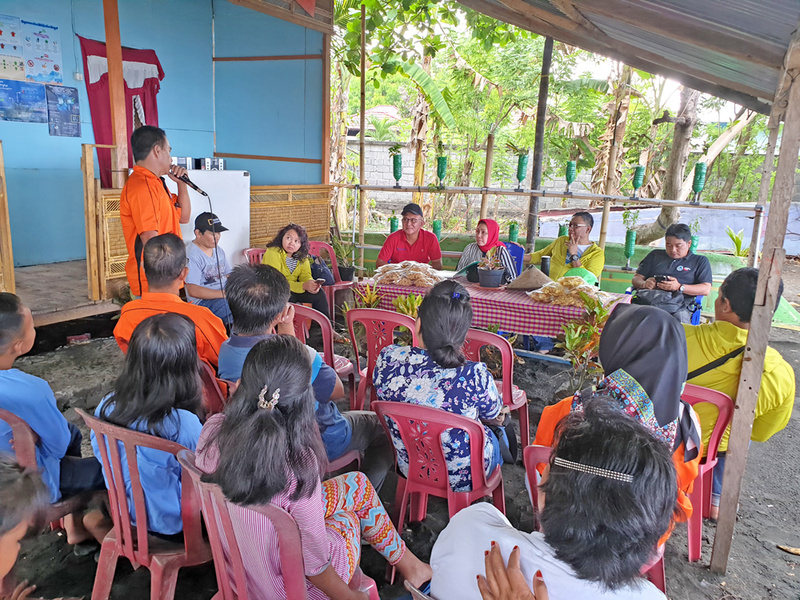 BAPPENAS officials have recently made two visits to Fish Forever field sites in North and Southeast Sulawesi Provinces to understand better how the Fish Forever model supports the implementation of this global goal. Despite the uncertainty that may come with next year’s presidential elections in Indonesia, Rare will continue working with BAPPENAS to explore and reinforce the relevant links that exist to prioritize the small-scale fisheries sector within the SDGs, the mid-term development plan, and other national development priorities, including climate change and blended finance. Representatives from Margaret A. Cargill Philanthropies and the Walton Family Foundation interact with Tomia Island’s Komunto fishing community in Indonesia’s Wakatobi National Park during a site visit hosted by Rare and WWF, October 2018. Komunto’s fishing community won the UNDP Equator Prize in 2010. Stanford University d.school’s Design for Extreme Affordability course: team members from ForTuna and frost.d, and Rare course liaison, Rare Philippines Director, Market IDeaS (Innovation, Design and Solutions). On a list of key components for seafood cold storage, one might mention a cooler, ice, a safe temperature, rigid insulation materials, minimized airflow, or a host of other processes or materials designed to maximize the quality of a fish caught at sea. Likely missing from most lists are two foundational qualities that drove students from the Stanford University d.school to find practical ways of improving the livelihoods of traditional coastal fishing communities in the Philippines: Affordability and Empathy. In late 2017, two teams from the Stanford University d. school’s Design for Extreme Affordability course teamed up with Rare and Fish Forever to address the Philippines’ minimal market of at-sea cold chain storage options for small-scale fishers. Team ForTuna created an affordable cooler that could fit in small fishing boats, bancas, big enough to keep high-value, large pelagic fish species (e.g., tuna) cold; the second team, Frost.d, created a low-cost and energy efficient unit that stores surplus ice so that fishers can overcome the variability of ice demand. 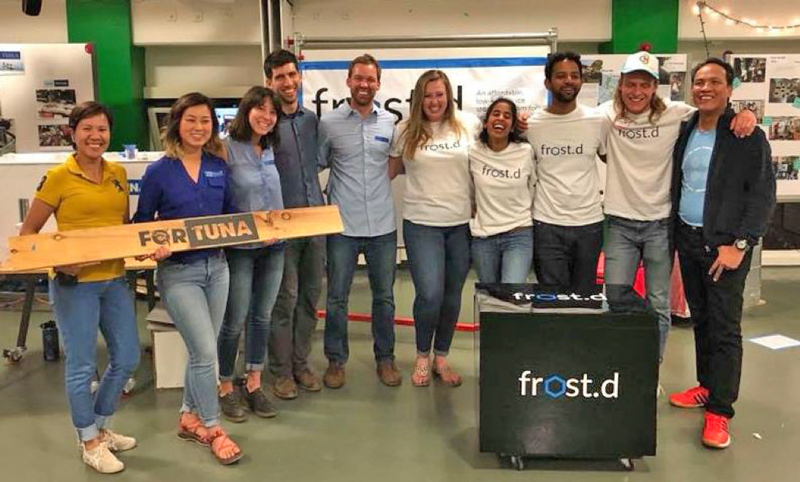 As the name of the course implies, both teams used a design thinking approach to search for an affordable and practical solution to increase fish quality from boat to market. Each approached the design challenge using empathy—a cornerstone of the design thinking approach that promotes an in-depth appreciation of users’ pain points—and embedded themselves within fishing communities and the challenge to try to solve it. The potential impact of these solutions is two-fold. For the fishers, the projected impact of the frost.d unit ice selling businesses empowers fishers to earn 50-100% of the profits that an ice-selling business can make over a nine-month period, and increases the quantity of ice available to them during the peak fishing season; with ForTuna’s product, the margins afforded by higher quality storage and new market access could transition fishers from receiving $1.50 per kilogram for high-value pelagic fish, such as yellow-fin tuna, to $5.70 per kilogram. For the students, it’s an opportunity to translate their academic experience into simple but innovative solutions that can have a profound and direct effect on fisher livelihoods. Engaging this next generation of problem solvers gives Rare hope for a more sustainable coastal fisheries sector. Over the coming months, the two teams will pursue different avenues and timelines for future commercialization. Meanwhile, Fish Forever—in partnership with Rare’s Center for Behavior & the Environment—will continue to partner with others in conducting such ‘micro-experiments’ that address barriers to sustainable fishing and help fishers adopt new behaviors and solutions. 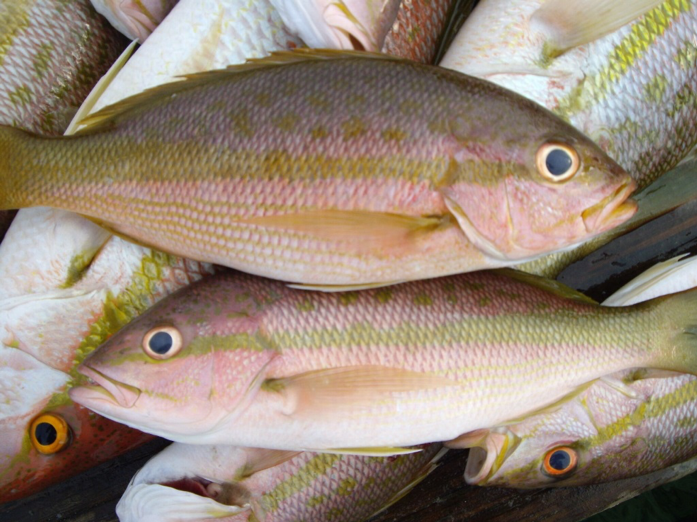 Yellowtail Snapper—a commercially-important Caribbean fish. Fish body shape is remarkably revealing—and according to research conducted by Rare and partners on a commercially-important Caribbean fish, the yellowtail snapper, it may be essential information that could make fisheries management simpler. Study Results: Recent research, published in July in the Journal of Applied Ecology, co-authored by Dr. Box, Rare’s Fish Forever lead, and the Smithsonian Institution, found that fish of the same species can have different body shapes based on where they live. These differences may be due to food and habitat quality, currents, and other micro-environmental differences between locations. By using morphometric analysis—the quantitative study of variation in biological shape and size of living organisms—combined with the relative dimensions of individual fish, the research successfully differentiated the fishing bank from which local fishers caught their fish. Scientists found this method more accurate than using genetic approaches or microchemical analysis, two common ways of trying to identify the geographic origin of an individual fish. Application of the Results: Based on this study, Rare, together with our Technologist-in-Residence, Vikram Sahai (a founding Google.org engineer), and partners from the Smithsonian Institution and the University of California Santa Cruz have begun researching and developing a prototype for an origin verification tool to automate fish origin identification through image recognition and machine learning. Using field data of commercial reef fish species caught by Caribbean small-scale fishers, the prototype uses newly developed algorithms to automate fish measurements from imagery to identify subtle changes in body shape, color, and patterning. Why these results and their promising application matter: Fish Forever empowers communities to manage local fishing activities. A large part of this success relies on building compliance among local fishers to regulations, including respecting no-fishing areas. To maintain compliance, however, some level of enforcement is necessary. The traditional approaches are to operate patrol vessels—as both a visual deterrent and a direct enforcement mechanism—or track fishing boats through satellite or cell phone systems. Sustaining these approaches is time intensive and costly. But what if we could accurately confirm that landed fish were coming from particular areas? And conversely, identify if they were illegally caught from protected reefs? If the promising early results continue, fish biometrics may offer a new and innovative cellphone-based solution that communities could use to confirm compliance with agreed fishing areas. What’s next: The immediate goal is to expand the training datasets to improve accuracy, increase the number of species that can be verified, and extend spatial coverage. We then plan to test the system in target communities in Honduras and evaluate its potential to augment existing monitoring control and surveillance measures. Rare is thrilled to welcome Diana Vasquez to the team. Diana will spearhead Fish Forever’s program in the Mesoamerican reef, joining the Fish Forever Leadership Team that consists of the country lead for each program country. Diana joins Rare from the Honduran Centre for Marine Studies (CEM)—a Rare partner in the region—where she has been CEM’s Executive Director since 2012. In her new role, Diana will build on her extensive regional knowledge and deep experience in the field to help deliver managed access with reserves in the MAR. Meanwhile, she will maintain and strengthen her connections with CEM and other local partners implementing marine conservation and fisheries work in the region. Diana will continue to be based in Honduras leveraging the program’s global capacity to accelerate work locally. Rare in Brazil is transitioning to focus Fish Forever’s implementation at the sub-national (i.e., state) level to enhance delivery efficiency and expand programmatic impact. Rare staff and operations will move to locations that better reflect this strategic direction, including a new headquarters in São Paulo; a field office in Belem in Pará state; and government engagement efforts based in Brasília. We will close our office in Rio de Janeiro at the end of 2018. Over the last year, in partnership with WWF, Rare in Indonesia has supported the SES Province Office for Marine Affairs and Fisheries (DKP Province) to draft the provincial marine spatial plan (a.k.a., RZWP3K). Rare has facilitated numerous consultative meetings and technical discussions to collect stakeholders’ inputs and create general agreement on the province’s 0-12 NM spatial marine area use and management. The draft plan now includes allocating 0-2 NM from the coast for small-scale fishers and provides the regulatory basis for developing managed access with reserves throughout provincial waters out to 12 NM. This near-final draft must pass several reviews by the provincial and national government before finalization, possibly by year’s end. To ensure program integration, Rare is also working closely with the SES Province Office for Development Planning (BAPPEDA) to include managed access with reserves in their 2019-2024 budget. From October 23-24, at the Bogor Agricultural University, Rare staff presented six papers from our experience in Indonesia using managed access with reserves and behavior change as part of national integrated coastal resource management (ICRM). 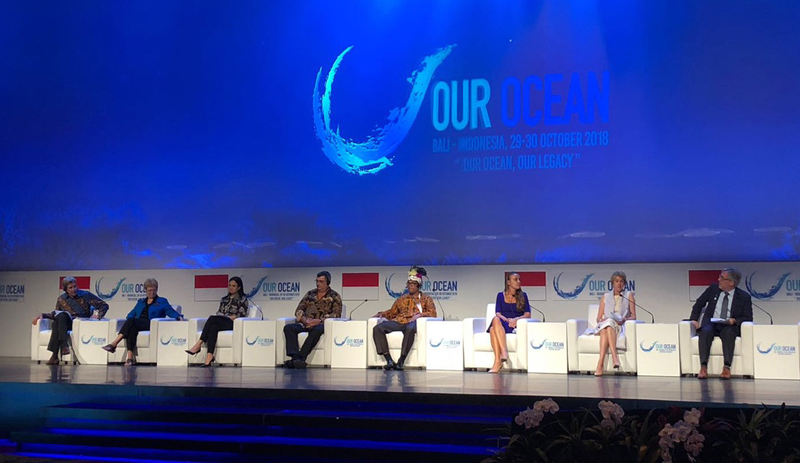 Within his remarks as the keynote speaker, Rare Indonesia Vice President, Taufiq Alimi, emphasized the critical need to recognize the coastal fishing sector within Indonesia’s national development planning, budgeting, and policymaking. Predicting vulnerability to management changes in data-limited, small-scale fisheries (Aug 2018). The authors of this study use simple fishery attributes from fishing communities, such as species assemblages and compliance, to illustrate how threats to livelihoods can be identified early to inform decision-making and adaptive management. Qualitative impact evaluation of a social marketing campaign for conservation (Sep 2018). This study suggests that social marketing campaigns, including a 1998 Rare Pride Campaign, contributed to a sustained increase in parrot populations by helping to change behaviors towards the parrot, shifting social norms, and increasing compliance with existing environmental laws. The campaigns also helped to build local capacity for conservation, which increased behavior change sustainability efforts over the long term. Incorporating feasibility and collaboration into large-scale planning for regional recovery of coral reef fisheries (Oct 2018). Jones K.R., Maina J.M, Kark S., McClanahan T.R., Klein C.J., Beger M., (2018). Incorporating feasibility and collaboration into large-scale planning for regional recovery of coral reef fisheries. Marine Ecology Progress Series 604: 211-22. This study demonstrates that incorporating fish biomass recovery, fish management feasibility, and international collaboration into large-scale planning can prioritize lightly-fished regions and communities with histories of more effective management, which may further burden people in poorer countries where effective fishery management for food security is badly needed. This paper also highlights the need to incorporate larval dispersal into spatial prioritization. Maneuvering towards adaptive co-management in a coral reef fishery (Sept 2018). Hunter C.E., Lauer M., Levine A., Holbrook S., Bassweiler A.R., (2018). Maneuvering towards adaptive co-management in a coral reef fishery. Marine Policy. 98: 77-84. This study shows that factors such as social mobilization, direct links to the fishery, and geographically-relevant governance boundaries are crucial to improve co-management efforts. Gravity of human impacts mediates coral reef conservation gains (Jul 2018). Cinner J.E., Maire E., Huchery C., MacNeil M.A., Graham N.A.J., Mora C., McClanahan T.R., Barnes M.L., Kittinger J.N., et al. (2018). Gravity of human impacts mediates coral reef conservation gains. Proceedings of the National Academy of Sciences 115(27): E6116-6125. This global study shows that reserves placed where there are moderate-to-high human impacts can provide substantial conservation gains for fish biomass, yet they are unlikely to support essential ecosystem functions like higher-order predation, which is more prevalent in reserve locations with low human impacts. Informing the design of territorial use rights in fisheries from marine protected area theory (May 2018). Aceves-Bueno E, Halpern B.S., (2018). Informing the design of territorial use rights in fisheries from marine protected area theory. Marine Ecology Progress Series. 596: 247-262. This study recommends that TURF site selection should account for critical habitat distribution for the targeted species, avoid locations with high levels of disturbance, and consider the location of historical fishing grounds. An adaptive assessment and management toolkit for data-limited fisheries (Feb 2018). This study describes an Adaptive Fisheries Assessment and Management (AFAM) toolkit for data-limited fisheries. Goal: To deliver replicable and scalable community-rights based management across ten countries, using a global network of 500 local leaders to secure livelihoods for one million fishers, alleviate poverty, ensure food supply, and protect coastal ecosystems from chronic threats.